Where do Ontario parties stand on the environment? What is the next premier of Ontario going to do for young people? The leaders of Ontario’s three main political parties will square off in the first televised debate in #CityVote: The debate — focused entirely on issues relevant to those who live and work in Toronto. The debate will take place May 7, exactly one month before the province heads to the polls. Commercial-free coverage will begin at 6 p.m. live on City, CityNews.ca, the CityNews apps for iOS and Android and the CityNews Facebook page. The debate will also be broadcast in Punjabi and Mandarin on OMNI 2. Ontario PC Party Leader Doug Ford, the NDP’s Andrea Horwath and Liberal Premier Kathleen Wynne will take part in the event. The Ontario election is on June 7th. 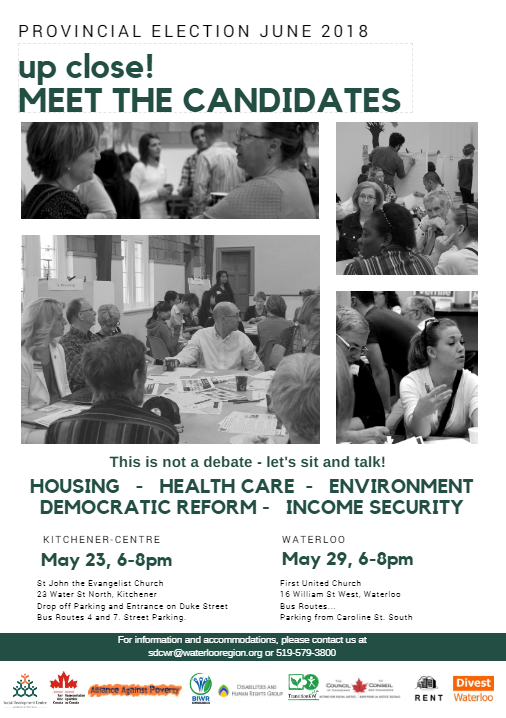 Come hear the candidates for Waterloo speak about affordable housing, and ask them about their support for co-op housing. Food and refreshment will be available. Refugee and immigration debate/panel on May 12 at 100 Rittenhouse Drive 1:30- 3:30. THEMUSEUM in downtown Kitchener is inviting all regional candidates for the upcoming provincial election from both Kitchener and Waterloo to a ‘Cultural Exchange’, an opportunity to discuss the importance of arts and culture with members of cultural organizations and institutions, as well as members of the general public. This is something that THEMUSEUM has done before every election period since 2010. For this event, we have the room set-up in round tables, with a candidate situated at each table along with community members. Chosen at random, each candidate with have 3-5 minutes to do a quick spiel to the room about their platform on arts & culture, and then everyone will have the opportunity to discuss this platform with others at their tables. This is not a debate, but a conversation. This continues, with the candidates rotating tables after each session, until all candidates have had the opportunity to speak. On the evening of the 15th, doors, and bar, will open at 6:30pm, and the event will begin at 7pm sharp. If you have any questions, or need any additional information, please don’t hesitate to contact me. Zdravko Gunjevic, GPO candidate in Waterloo, will be participating in the All-Candidates debate at WLU on May 16. This debate will focus on themes impacting post-secondary institutions, including provincial funding structures, community integration, and the future of pedagogy in higher education. What is the third line in Ontario’s budget and a dominant force in our local economy? Post-Secondary Education (PSE). Want to know where Waterloo Provincial candidates and their parties stand on important PSE issues? Join us as CBC’s Craig Norris moderates a Waterloo candidates debate on the present and future of PSE. With three PSE institutions right here in Waterloo, we’ve come together to bring the candidates to University Ave to hear what they have to say on the issues that matter to us. Candidates in the Kitchener & Waterloo Area Ridings are invited to a Q&A event to highlight their party’s policies regarding accessibility, including the Accessibility for Ontarians with Disabilities Act (AODA), and the Assistive Devices Program (ADP). Technology fosters inclusion, and it reduces feelings of isolation and depression for people who are blind, partially sighted or Deafblind – but only when it’s accessible, available and affordable. ADP is a lifeline for many Ontarians living with disabilities. Without ADP, many would be unable to afford an assistive device. While we know Ontarians who are blind, partially sighted or Deafblind have benefitted from ADP, we also know there are significant areas that require improvement. For example, the funded categories (e.g. visual aids) have not been significantly updated for nearly 20 years, and the paper-based administrative process is burdensome and inaccessible, resulting in unnecessary delays. Help us get up-to-date technology into the hands of Ontarians who are blind, partially sighted or Deafblind. Join us for the Re-Vision ADP campaign launch! Visit Re-Vision ADP to learn more. Candidates are invited to participate on a panel as part of a Q&A with attendees. Rogers TV (Cable 20 in Waterloo Region) will be airing a debate with the 2018 Ontario provincial election candidates from Cambridge. The SPCCND will be hosting Provincial All Candidates Meetings for the ridings of Cambridge and Kitchener South Hespeler. Come out to hear your local candidates for the upcoming provincial election views on social issues and have the opportunity to ask your own questions. This is not a debate – Let’s sit and talk! The broadcast consortium of CBC, CTV, Global, TVO, CPAC, and CHCH has so far scheduled one debate — on Sunday, May 27 at 6:30 p.m. at the CBC Broadcasting Centre. The residents of Luther Village on the Park invite the candidates for the provincial electoral district to participate in a panel discussion to be held in the Great Hall at Luther Village on the Park, 141 Father David Bauer Drive in Waterloo, from 10:45 am to 11:45 am on Monday, May 28, 2018. Following the formal panel presentation, there will a table available for each participant at the back of the room where you can meet with residents individually to answer any additional questions and distribute campaign materials. Chamber members are encouraged to submit questions to the provincial candidates to answer for the Provincial Riding of Kitchener South-Hespeler. Please forward your questions to Ian McLean, President & CEO, and/or Art Sinclair, VP Public Policy and Advocacy, at the Chamber. If you are a Twitter user you can forward your questions to the Greater Kitchener Waterloo Chamber of Commerce Twitter account @GKWCC. The Forum will be taped by Rogers for you to view from the comfort of your own home. Stay tuned for those details. This Forum is open to the general public, seating is based on first come first serve. Jeff Pickel from 570 News will moderate. Further details on the format will be sent prior to the debate. The New Hamburg Board of Trade is holding a moderated debate with prepared questions. Chamber members are encouraged to submit questions to the provincial candidates to answer for the Provincial Riding of Waterloo.